It’s called the Self Express: and the catchy name isn’t the only unusual thing about the 38-foot bus which a group of Northwest students and recent graduates are converting into a living space that will transport them across the country this summer. By the time it’s finished, the former 1989 school bus will be ready to run entirely on used vegetable oil, and will be outfitted with a solar panel installation on the roof. For the bulk of the summer it will serve as a temporary home for six youth activists determined to show that sustainable living in the twenty-first century is both possible and practical. The Self Express project is a grassroots effort launched by youth organizers based at Linfield College in McMinnville, Oregon who have a vision for a better future. 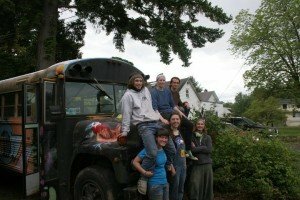 Traveling across the US in an essentially carbon-neutral vehicle, they plan to create a real-life example of community-oriented living. The group intends to connect with local nonprofits and charities in locations they visit across the United States, performing service and volunteer work that gives back to the community. They will also travel to and participate in key events in the US climate movement happening over the next few months. In this way the Self Express project connects the hands-on solutions work needed to jumpstart a transition to a clean economy with the political organizing and activism that’s essential to building the sustained movement that will get us off fossil fuels for good. Considering the scale of the challenge we’re facing, it’s neither logical nor useful to argue about whether climate activists should be addressing problems or building solutions. We urgently need to do both these, things, which is why youth organizers aboard the Self Express will be connecting with community solutions projects while also facilitating communication between grassroots groups fighting fossil fuel infrastructure. At the same time, the Self Express serves as a microcosm for the kind of future we need to create. The Linfield students and alumni will be harnessing social media to track the progress of their mission, and will post frequent updates as the bus makes its journey cross-country. To follow them on their journey (and get a glimpse of the vast amount of work that’s already gone into preparing the bus), visit and like the Self Express Facebook page. Once the journey begins on June 20th, the group will also be posting on a separate web site. For all those who engage with students on the bus in communities they visit, or who decide to follow their progress online, the Self Express project should serve as an inspiration, and a reminder of the initiative it takes to build a better future. Six youth activists in Oregon have found a way to use their summer to create positive change while putting their ideals into practice. How will you do the same?